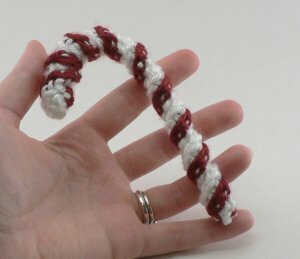 Candy Cane is an original crochet pattern by June Gilbank. Additional info: You'll also need 1 pipe cleaner for each candy cane, to keep it in shape. The ends of the pipe cleaners are protected, but please be sensible and don't use this as a baby toy unless you skip the pipe cleaners. Date Added: 11/16/2013 by Lydia T.
Date Added: 02/02/2011 by Mackenzie K.
Date Added: 05/07/2010 by Kathy B.